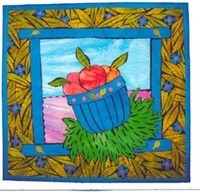 I got an email reminding me that quilt camp classes are filling up quickly, and thought OMG, I forgot to sign up! It's held in my hometown, a quite cool place in Arizona in the summertime. 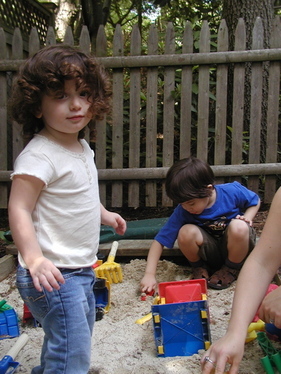 I signed up for two classes, both by Laura Wasilowski. 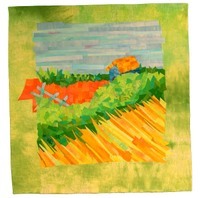 When browsing through the course catalog, I was drawn to her quilts. I hope I like the technique, as I'll be spending two days doing different quilts with it (hopefully, maybe the spaces are gone already, we'll see). The technique is a fusing one, I've never done anything like this so we'll see how it goes. I went to the welcome group presentation last year, and since I had just finished my very first beginning quilting class, I felt like such a neophyte. 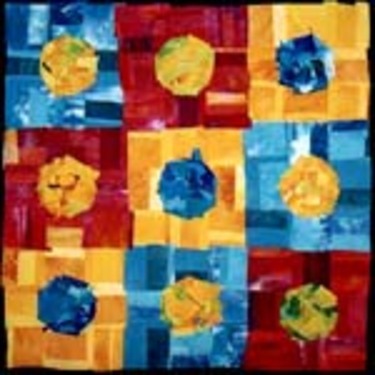 But it was really interesting to see all the different quilts that people had made. The classes I signed up for say they're for all levels, or "confident beginners." Well, I don't know how confident I am. I'm pretty confident about my sewing ability, but all that quilting terminology, and the techniques that I don't know. I figure it's not like anyone is going to pelt me with rotten tomatoes if I don't know something, so I'll just go along and learn what I can. I'm looking forward to this! We're on our way back home, and have already done a 2-day stopover in NYC at Steve's parents, followed by a 2-day stop in DC to do some sightseeing. On our first day of driving we made it to Zanesville, OH. Today, our second day of driving has taken us to Effingham, IL. Tomorrow I plan for us to be in Kansas City, with an extra day stopover for the driver to rest. 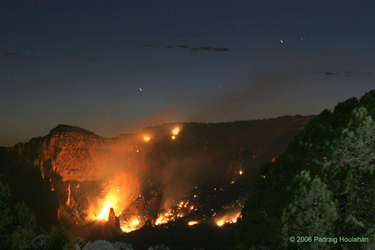 Here's what we're headed toward at home: drought conditions and wildfires. 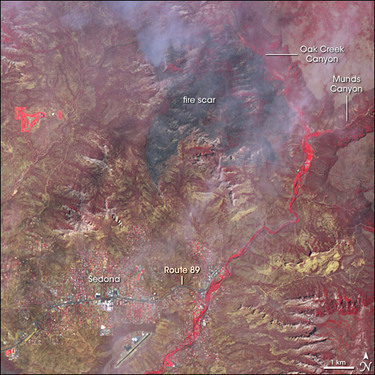 A satellite picture of a 4000+ acre fire a little south of us, the Brins Fire. Picture details, color interpretation here. They've determined that this fire was started by a campfire. Ugh. The forest is closed now, hopefully that will help. And here's a photo taken by someone at work. It's not from the office, don't worry, he had to drive south a bit to get this viewpoint. But it's pretty startling and frightening. I'm thinking of putting a big bucket on the top of the car to catch the rain we're getting here in OH/IN/IL and bringing it back to AZ with me. After I finished my pocket bag, my mom said that she liked it and would like to have one too, in the same colors as mine. Wow, was I flattered. My mom used to sew most of my clothes when I was little, until I got old enough to be surly and want store-bought clothes. She always made such amazing clothes, even if I didn't appreciate them at the time. 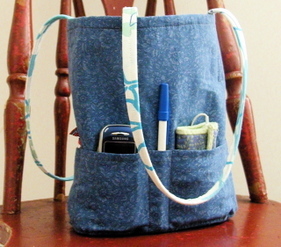 It was quite a thrill to think she would want me to sew something for her--so of course I made another bag for her. I was out of the liner fabric, so I rooted around downstairs through her fabric stash and found a coordinating solid blue. Being the second bag, I made some improvements, including deeper pockets and interfacing attached to the liner rather than to the outside. I'm happy to report that she likes it! That's her bag in front, mine behind. Max's cars for color interest. And a few of my mom's sewing implements that I've always liked. Particularly the awl, it's incredibly useful, even though it may not be immediately obvious that it would be. The fabric underneath is something my mom found at a flea market years ago, it looks Japanese, she got several yards of it for $1! Lucky me--she's given it to me! Another item we've acquired during this trip: my brother's yukata. It was made by my grandmother for my brother, apparently when he was about Max's age. All the sewing is hand done. It's amazing. And so wonderful to have. Max likes it, but was a little unsure about the obi. Another creation from the MS tea towels, this time a garage for Max's cars. 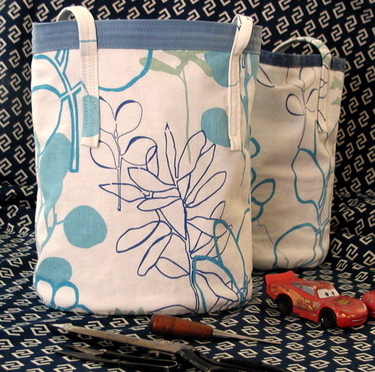 When I was making my pocket bag, he took the pocketed section and drove his cars into the slots so they could take a nap. This sparked an idea, so I took one of the tea towels and make a two-layer garage for the cars that could be rolled up. Then looking at it, I figured that the addition of a few ties would make it into a nice apron (or waist-mounted car conveyance). 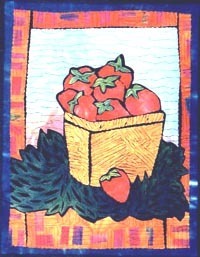 I picked the strawberry towel because out of all the fruit towels in the set, Max only likes strawberries. I didn't realize how girly it would look. 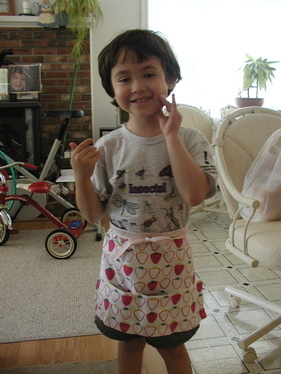 As if he doesn't have enough problems with people thinking he's a girl, now his mom is sewing him pink aprons. I made the ties extra long so they can be wrapped in back and then tied in front. 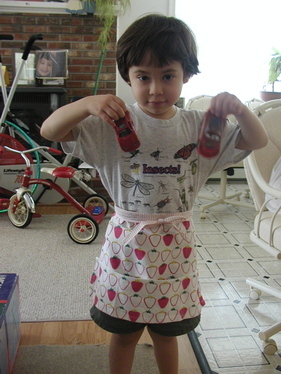 With this, it can also be worn as an apron by someone considerably larger, like a mama. Here's a look inside. I got the lovely blue lining fabric from Abby when I visited her last week. 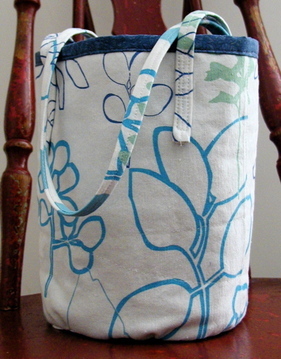 I think it goes nicely with the blue botanical print (from MS's "take the scenic route" set). Inside are my purse, cell phone, pen, iPod, eyebrow pencil, lipstick, tissues, and "buzzes" (chewy fruit candies) for Max. 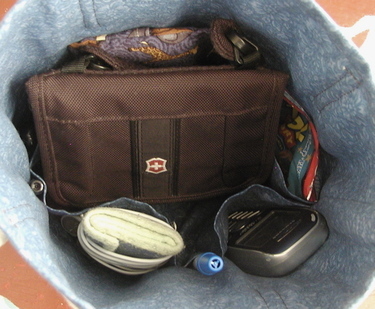 Here's an inside-out view of the bag, so you can see the pockets better. I think I should have made them a little deeper so the things will stay in better. Also I'll probably do some hand quilting to keep the 3 layers (2 fabric, 1 heavy interfacing) together better. Once again, this is an oval-bottom bag. I'm getting a bit better at making them, although the bottom on this one is still a little uneven, and having the two non-attached layers made things challenging. I like how this one turned out. It's very light and summery. I hope it works well for what I want to it to do! I'm going to test it this afternoon with a trip to a Japanese book store that I hear has craft books. I just got notification of a remnant sale at Malden Mills. They make superb fleece, not the cheapie stuff that wears through after just a few wears. They have two offerings, a bag of 17+ yards for $30, and a bag of 12-15 yards for $45. Shipping included in those prices. See the details here: http://www.maldenmillsstore.com/remnants.asp. I got one of these remnant bags a few years ago, and split it with a friend. I still have two huge garbage bags full. I think I got the 17+ version, since my pieces are all black/grey. It was a hugely great bargain. I've been hoarding the pieces because although they claim there are some defects, the majority of pieces were in perfect condition. And in the others, the defects were small and generally localized so the majority of the piece could still be used. I got wonderful thick sherpa fleece, great thin stretchy stuff for running pants, etc. I'd love to get the 12-15 bag, because it has colors and textures, but I really can't because I already have too much stuffed into the closet. I'm trying to practice restraint, but let me tell you how hard it is! So I thought I would tell everyone who visits here, so I can live vicariously through anyone who might get one of these great bags. Today Max and I were very fortunate in getting to visit with the original "she" of While She Naps: Roxanne! Of course her wonderful mom Abby and baby sister Stella were there too. In keeping with her blog name, Roxy was napping when we arrived. It turned out to be excellent timing because it allowed Max to get a little less shy (although it wasn't obvious in Abby's picture of us), and it also gave me a chance to get a tour of her amazing house. It's so beautiful and stunningly decorated. I want to live there. I also got to see her craft room in person, including the wonderful Cube Zoo and other creations. Let me tell you: they're amazingly cute on her blog, but even more so in person, if that's possible. It's been great to "meet" fellow crafty bloggers over the net, people who like to make things like I do, and even better to get to talk with great people in person! 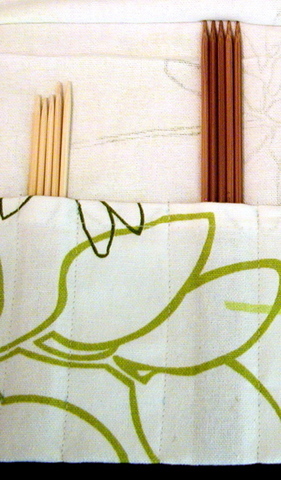 Some "finally"s: I'm finally back with a craft-related post, I finally got me some of those Martha Stewart tea towels from Kmart that I've been reading about in everyone else's posts, and I finally made a needle roll for dpns. 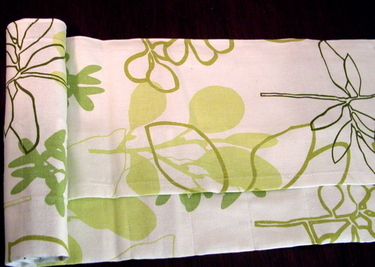 Here it is, made in the green floral print from one of the Martha tea towel collections. I used the whole towel, and made it with 17 slots (1 to 2.5 inches wide), for dpns from 00 to 11, with extra slots for small crochet hooks and small scissors. I've been carrying some of my dpns with me across the country in a ziploc bag that is by now poked through with many holes. At home I keep them in a plastic box with my other needles, but I had no organization for them, and always had to go looking through old, unfinished WIPs for ones I needed. Once back here near Boston, staying at my parents' house, I planned to go to Kmart because we don't have one in our neck of the woods. Of course I got the fruity set that I've loved seeing in other blogs; I also got the floral set, and had to restrain myself from getting a few of the other sets. 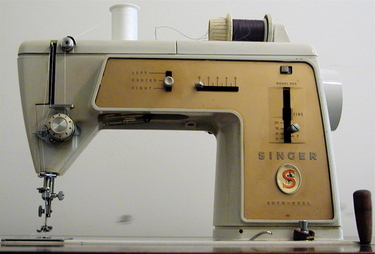 I sewed this on my mom's old Singer, still going strong, the same one I used in middle school when I was learning to sew. Apparently when I was very little I used to stand on my mom's chair, behind her, watching her sew. Max wanted to watch me sew, so he dragged a chair in from the kitchen table and sat next to me, helping as much as he could. He would flip the backstitch switch, turn the dial to put the needle into the fabric, and hand me the small scissors to snip threads. It was a nice passing-down-through-generations kind of activity, on the same old machine. Another good thing about visiting home: Portuguese malasadas! They're a fried dough kind of thing, but eggier than those I usually see at fairs. 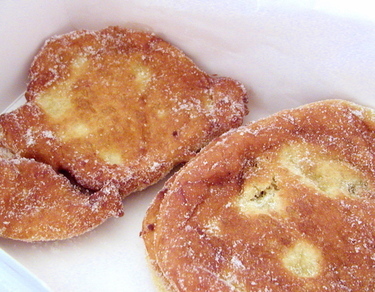 I know there are lots of types of fried dough treats, but I'm half Portuguese and these are the ones I grew up with. The ones I've gotten in Hawaii (at Leonard's!) are more spherical and less eggy than these, but still good. I'll take a malasada wherever I find one. We went to a local store and bought the last half dozen that they had. My mom said that someone told her how to make a quick one or two malasadas: by using store-bought crescent roll dough (you know, the kind in the cardboard tubes), snip off a bit, roll it out, fry it up in some oil, drain then roll in sugar. It seems almost sacrilegious, but the lady who told her was Portuguese, so it should taste about right. While I'm here I'll probably just go to the bakery, but I may get desperate enough to try it when I'm back in Arizona.